AAL WINS SECOND MAJOR AWARD IN TWO WEEKS! Wednesday night, AAL won the ‘Excellence in Project Cargo Breakbulk / Heavy Lift’ award at the Lloyd’s List Australia 21st Shipping Industry Awards 2016. Our colleagues, David Church and Russell Smith attended the event in Sydney on AAL’s behalf (pictured). 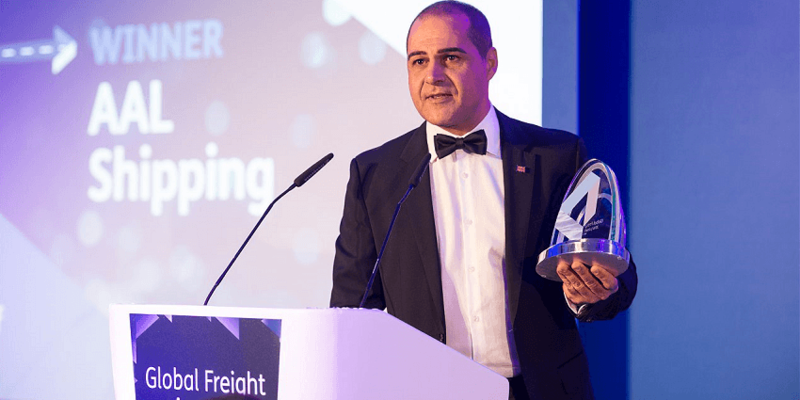 This is AAL’s 2nd award in the same amount of weeks – having won ‘Breakbulk Operator of the Year’ at the Global Freight Awards 2016 in London just 2 weeks ago. We are truly honored with this fantastic and unique achievement and will harness this acknowledgement to drive us forward and achieve even more for our customers and partners all over the world. Thank you to the Lloyd’s List Australia Committee for voting for us and to all our customers and partners in the region for their continued support. We dedicate this win to our brilliant Australia team! November 2016 and AAL delivers a giant ‘amine reactor’ to Singapore’s Keppel Shipyard from Shanghai, for the Golar Hilli FLNG terminal. Comprised of various giant components, TWO particular pieces measured 58m and 35.5m in length and 243mt and 505.7mt respectively. 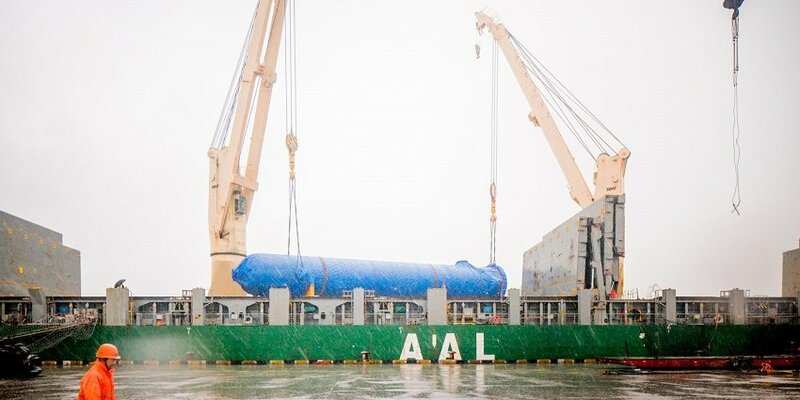 Both during Loading and discharge, torrential rain downpours threatened the patience of the photographers involved, but did nothing to slow down the heavy-lift operations of the expert AAL teams involved. Well done, teams – glad you had your waterproofs on! November 3 2016, at a glittering ceremony in London, AAL collected the Global Freight Awards’ ‘BREAKBULK OPERATOR OF THE YEAR 2016’ – the first time these annual awards have featured a dedicated category for the breakbulk sector. Kyriacos Panayides picked-up the award on our behalf. 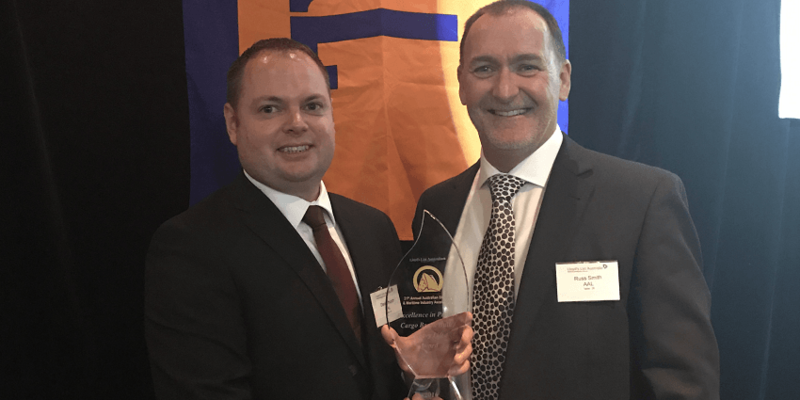 He commented, ’This is a tremendous honour and especially significant in that the award was independently voted for by the readers of Lloyd’s Loading List – a readership comprising of our customers, partners and associates from all over the world. This latest win for AAL is recognition of a sustained period of growth and development in which we have expanded our global footprint, boosted operating fleet capacity and launched new added value services for our customers.